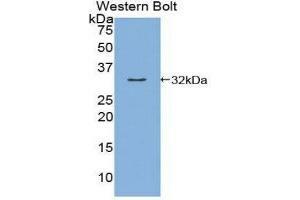 Specificity It has been selected for its ability to recognize KLK9 in immunohistochemical staining and Western blotting. Content: The quality control contains recombinant KLK9 (Met1~Thr254) disposed in loading buffer. Usage: 10 µL per well when 3,3'-Diaminobenzidine(DAB) as the substrate. 5 µL per well when used in enhanced chemilumescent (ECL). Loading Buffer: 100 mM Tris(pH8.8), 2 % SDS, 200 mM NaCl, 50 % glycerol,BPB 0.01 % , NaN3 0.02 % .